All salmon entering or leaving the Lake Washington/Cedar/Sammamish Watershed do so by passing through the Locks in Ballard. 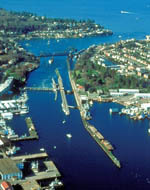 The locks are a partial migratory barrier for salmon, particularly juvenile salmon heading towards Puget Sound, and for adult salmon returning at periods of low flow. Fish access and passage barriers are complicated by high water temperatures and freshwater/saltwater exchange at the locks. Salmon habitat projects in the Locks Subarea funded through the WRIA 8 collaborative process are now included in the Habitat Work Schedule (HWS) state-wide website. In the website, click on the WRIA 8 watershed on the state map to enter our HWS website.